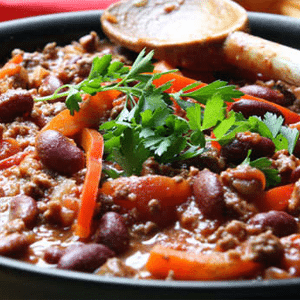 This hot, flavorful habanero chili is so tasty, even meat eaters will love it. It’s made with seitan, a vegan meat-alternative that crumbles just like ground beef, and absorbs the spicy flavors of the sauce. The recipe makes a whopping 10 servings, making it perfect for this week’s meal prep and several more dinners in the future, just freeze the remaining portions. 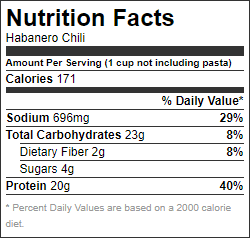 If you find habanero too spicy, you can substitute with jalapeño or bell pepper. Place seitan in food processor; pulse until it has the consistency of ground beef. Set aside. Heat large skillet, lightly coated with spray, over medium-high heat. Add onion; cook, stirring frequently, for 5 to 7 minutes, or until transluscent. Add garlic, habanero, and seitan; cook, stirring frequently, for 3 to 4 minutes, or until seitan is golden brown. Add chili powder, paprika, salt (if desired), and pepper; cook, stirring frequently, for 2 additional minutes. 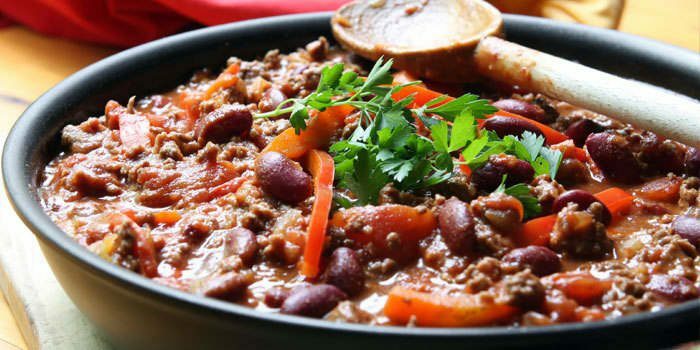 Add black beans, kidney beans, and tomatoes; cook, stirring frequently, for 5 to 7 minutes, or until mixture is heated through.